Cuba is allowed 20,000 US visas per year, but this US administration is making it harder for Cuban citizens access to this right the island has had since 1994. July 9 (teleSUR) The Cuban government is accusing the United States of hampering Cuban citizens’ access to a US Visa. The administration of President Donald Trump “has created obstacles to the fulfillment of its obligations, specifically regarding the granting of 20,000 migrant visas annually,” said Cuba’s director for bilateral relations with the United States, Yuri Gala. Gala said that the US met its 2016 and 2017 quota of granting 20,000 Cuban visas but said, “apparently this will not happen this year.” She blamed the low number of 2018 visas – the precise number was not disclosed – on the U.S. government’s decision to close its Havana consulate and transfer its workload to the U.S. embassy in Bogota, Colombia, and later to Guyana. The U.S. decision to move its Cuba operations was the result of so-called ‘sonic attacks’ that took place throughout 2017. 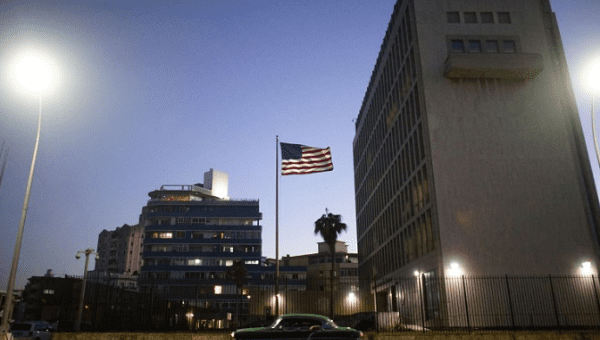 U.S. State Department officials claimed that Cuba somehow created sonic attacks that caused concussion-like symptoms on the 24 U.S. embassy employees working in Habana between Nov. 2016 and Aug. 2017. The Trump administration claimed the attacks were politically motivated. No substantiating evidence to support the accusations – by the U.S. or Cuba – was ever produced. Cuban scientists said such an audial attack even defied the laws of physics. The 20,000 Cuban visa quota was introduced in a 1994 bilateral agreement. The incident has led to heightened tensions between the two countries after several years of increased economic and diplomatic openness under the former U.S. president, Barack Obama. The U.S. most recently expelled 17 Cuban officials from their diplomatic posts in Washington.